Successfully Added COB LED Headlight - Durable Design, 110 Lumen, 3 Light Modes, Weatherproof, Up To 100,000 Hour Service Life (Blue) to your Shopping Cart. This compact LED headlamp will provide you with light in the darkness anywhere you go. Perfect for people that love to go out camping, night fishing, a hike after dark, or simply to have at hand in case of an emergency – this cheap LED headlight will always be there to light up the path ahead. 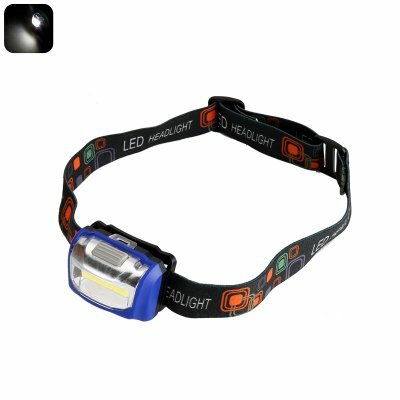 Featuring a lightweight design and coming with a comfortable elastic headband, this LED flashlight can be worn conveniently on your head without you even noticing it’s there. Its durable body has been crafted out of a tough ABS material, allowing you to use this little beauty in the harshest of environments without needing to worry about damaging your torch. As a true outdoor flashlight, this headlamp furthermore features an IPX 4 weather proof design, letting you use it in even the most extreme of weather conditions. Featuring the latest COB LED technology, this headlight emits an ultra-dense and bright array of light, truly lighting up whatever lays in front of you. With a maximum output of 110 lumens, you can be assured that the entire road ahead will be lit up – guaranteeing that you won’t run into any nasty surprises while taking a walk outside after dark. Its three light modes further increase the overall experience provided by this torch. Allowing you to switch in between low, high, and flashlight modes, you can be assured that this LED headlight always delivers the right soft of light for any occasion. Powered by three AAA batteries, this cool outdoor gadget brings along countless hours of usage time – enough for you to spend numerous hours outside or in a dark environment without needing to worry about battery life. The high-quality LED light supports up to 100,000 hours of usage time, guaranteeing that this headlight will light up your life for countless years filled with night time adventures to come. Thanks to its long life span, durable and weather proof design, high power, and comfortable fit, this COB LED flashlight is the perfect accessory for any outdoor enthusiast and people that work in dark environments. This LED headlamp comes with a 12 months warranty, brought to you by the leader in electronic devices as well as wholesale electronic gadgets..
Arabic: - مصباح LED - Chinese Simplified: - LED 大灯 - Czech: - LED reflektor - Danish: - LED forlygte - Dutch: - LED koplamp - French: - Phare de LED - German: - LED-Scheinwerfer - Hebrew: - פנס LED - Hindi: - एलईडी हेडलाइट - Italian: - Faro LED - Japanese: - LED ヘッドライト - Korean: - LED 헤드라이트 - Malay: - LED lampu hadapan - Norwegian Bokmål: - LED frontlys - Romanian: - Faruri LED - Russian: - Светодиодные лампы - Spanish: - Linterna del LED - Thai: - ไฟหน้า LED - Turkish: - LED Far - Vietnamese: - Đèn pha LED.